IAB: US Internet Ad Revenues Up in 2015 | adaptifyed™ The Adaptifyed system for monetizing downloadable files is covered by U.S. patents: US9451011B2, US14318109, US15243350, and pending application: US20150007256A1. Second quarter revenues hit a new record and top Q4 revenues for the first time. The second quarter of 2015 generated a record-setting $14.3 billion in online ad revenues in the US, up 22.5 percent year over year, according to the Interactive Advertising Bureau (IAB). For the first half of the year, internet ad revenues in the US totaled $27.5 billion, a 19-percent increase year over year. This marks the sixth consecutive year of double-digit first half of year growth. 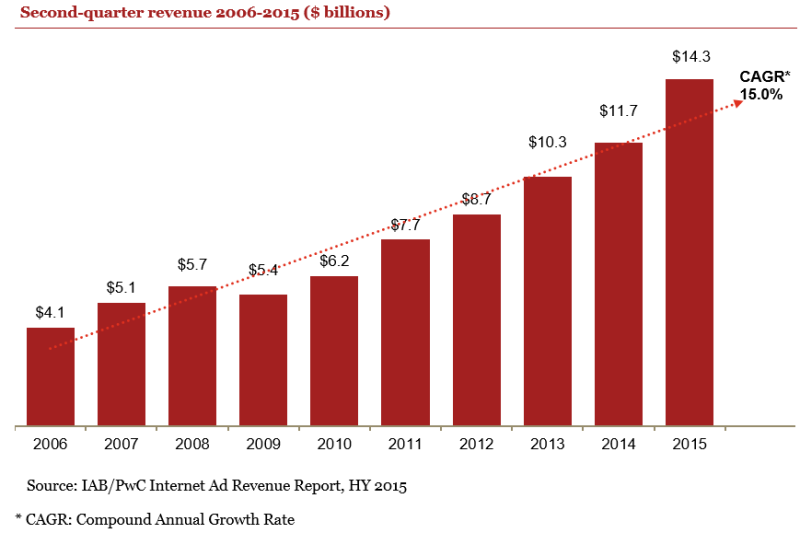 The IAB released the Internet Advertising Revenue report for the first half and second quarter of 2015 on Wednesday. The report finds that revenue growth continues to be driven by mobile, non-mobile video and social advertising spend. First, to clarify, the IAB combines many formats under the Mobile umbrella, including search and display, for the purposes of this report. Mobile ad revenues rose 54 percent to $8.2 billion, accounting for 30 percent of overall interactive ad revenue in the first half of the year. That’s up from $5.3 billion and 23 percent of the total ad revenues in Q2 2014. Mobile Search accounted for $3.6 billion of the total mobile pie, and Mobile Display (which includes banner ads, digital video, digital audio, sponsorships and rich media advertising served to mobile devices) made up $4.3 billion of mobile revenues. As you can see in the charts below, display has gained share from search on mobile. In the first half of 2014, search generated 51 percent of mobile revenues and display 47 percent. In 2015, that split has shifted to 44 percent of mobile revenues coming from search and 52 percent from display. Social advertising is a leading driver in the shifting revenue mix between search and display on mobile. Social media advertising revenues (which are largely mobile but include desktop figures, as well) have seen a 53-percent compound annual growth rate from HY 2012 to HY 2015. Social media ad revenues were $4.4 billion in the first half of the year, up from $4.1 billion in the first half of 2014. Social accounted for 16 percent of all revenues in the first half of 2015. Non-mobile video, while it remains small compared to search and mobile, continues to grow, with revenues topping $2 billion, up 35 percent compared to the first half of 2015. Non-mobile banner revenues have softened, falling off four percent from the first half of 2014. The IAB says several indicators point to Brand spending continuing to rise, including higher CPMs, increasing digital video revenues and the fact that revenue associated with impression-based advertising increased 13 percent year over year and held one-third of overall revenue share. During the webcast to provide an overview of the report, the IAB invited Peter Stabler from Wells Fargo to share his perspective on where future online spend growth will come from.